This piece was written by Rich Williams on March 6, 2011, shortly after the Ford building was torn down on Mashell Ave.
Eatonville saw a piece of their history demolished this week. The old Van Cleve Motors building had been part of Eatonville’s landscape for over eighty years. Like many other commercial enterprises in this area Van Cleve Motors is now just a memory. If only this building could have talked, what a story it would have told. George and Madge Van Cleve purchased this building from George’s brother-in-law Clint in 1934. At the time, it was one of two car dealerships in this area. The other was owned by J. H. Galbraith, the owner of Eatonville Lumber Company. 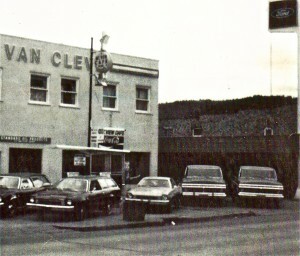 For years, Van Cleve Motors sold their Ford cars through Titus Ford in Tacoma, Wash. In 1952 that would change. That year, the Ford Dealership in Morton, Washington burned down and was for sale. 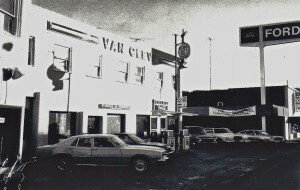 The Van Cleves bought the dealership and rebuilt it. 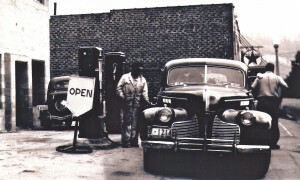 When the dealership reopened in 1953, the plan was to sell Fords at both Eatonville and Morton under the same franchise. Ford’s policy, however, at that time would not allow a dealer to sell their cars at two different locations under one franchise agreement. 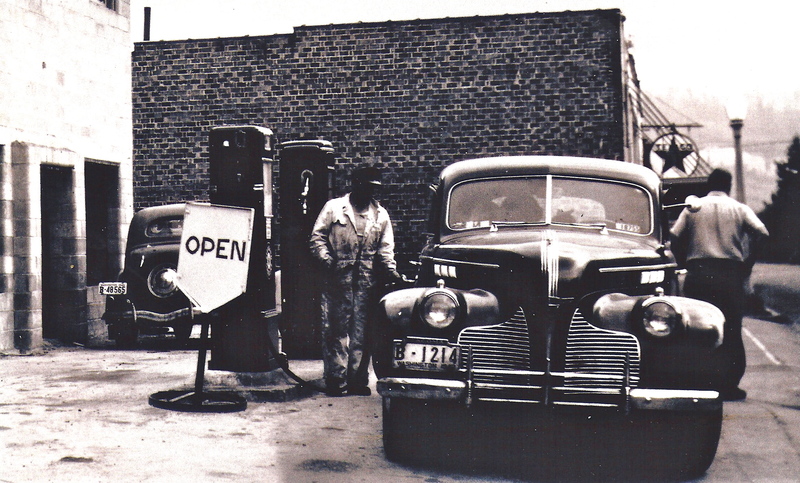 Ford Motor Company and Van Cleve quickly solved the problem by establishing a second direct serve franchise for Eatonville. Now things were on the move. George’s youngest son Jim and his wife Joan were managing the Morton dealership and George and Madge and their oldest son George Jr. “Lad” were managing Eatonville. Over the years, both dealerships were very successful. Customers from miles around would venture to Eatonville and Morton to buy their Fords from the Van Cleve family. During a customer’s visit to Eatonville, George “Pappy” would quote the best deal in the area and George Jr. “Lad” would answer any and all questions about the vehicle they were about to purchase. While the Van Cleve men were closing the deal, Madge, who reminded everyone of Aunty Bea, would be genuinely interested in getting to know each customer. It wasn’t unusual for her to remember your name and all your kids’ names, every time you visited the dealership. This combination of genuine customer interest, low overhead pricing and an exceptional knowledge of the product was the primary reason for the customer loyalty they enjoyed. In 1965, the first full year production of the Ford Mustang, Van Cleve Motors won another sales contest. The prize that year was an all expense paid trip to Ford’s Headquarters in Dearborn, Michigan. Two highlights of the trip were meeting Ford Motor Company President Lee Iacocca and receiving a brand new Ford Mustang. In 1972 and 73, the Ford F-100 and F-150 pickups were red hot. Sales were so brisk that Ford Motor Company production could not keep up with demand. 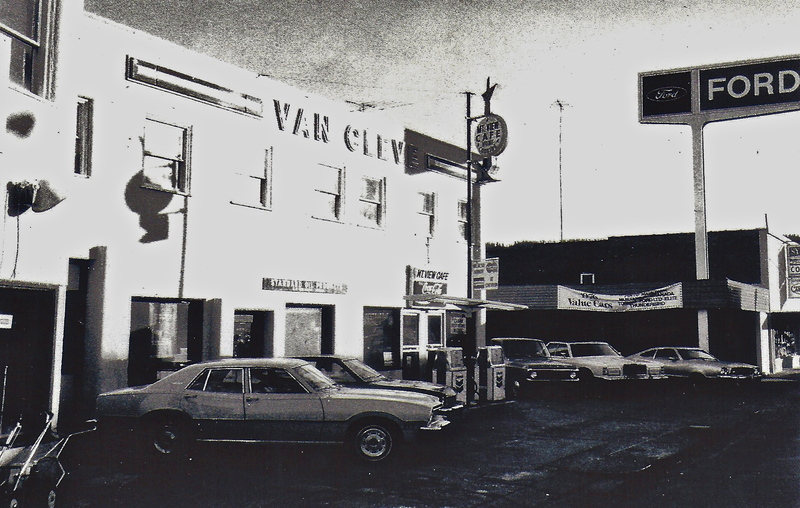 At one time during that period, Van Cleve Motors had over 100 pickups on back order. Seeing two fully loaded transports unloading vehicles on Washington Avenue each week was not unusual. Although the Van Cleve Ford Dealership in Eatonville is gone, the Van Cleve and Ford Motor Company partnership lives on. Jim Van Cleve Jr., his son James and his mother Joan are running a very successful third generation dealership in Morton, Washington. Winner of 20 Ford Motor Company Presidential Awards their philosophy of selling a quality product coupled with putting the customer first continues to be a winning combination. As the family looked at the rubble lying on the ground this week, they were saddened by the finality of this undertaking. 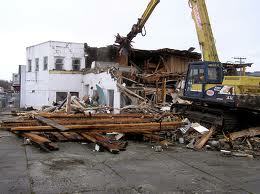 They and Eatonville were saying good- bye to a tired, dilapidated old building that once stood tall. Along with our good-bye’s we also thank Pappy, Madge, Lad, Rosemarie, Jim and Joan for all the good memories and for being a meaningful part of this community. Great article and pics you did here Rich. This stuff really tears me up inside, seeing all the bits and pieces of my childhood being demolished. Even though Van Cleave Ford was a competitor to my Dad’s Dodge dealership, It is still such a big part of what Eatonville was back in the 50’s and 60’s while I was growing up there. I guess I wish that some places would never change, but that isn’t reality. Thank you and Diane, and Pat for making this site that captures glimpses of what Eatonville used to be !! I traveled back to Eatonville this past summer and saw the empty lot where the very proud Van Cleve Ford building once stood. To see it gone reminded me of the struggles they had endured in the last few years and also that Lad, my best friend, was gone. I did, however get to meet Jim Jr. in Morton and go thru his racing albums. That kind of soothed the wound. Let me check. My uncle was Lad Van Cleve and I thought I heard they are restoring it now. But in the meantime, I’ll check with my Aunt and see if there are any shots.